Asynchronous Transfer Mode (ATM) is a high-speed networking standard intended for supporting the voice and data communications. ATM technology is designed for improvement the quality of service and utilization on the high-traffic networks. ATM works on the data link layer over twisted-pair cable or fiber. ATMs use the asynchronous time-division multiplexing and encode the data into the cells (the small fixed-sized packets). ATM networks have the cells of the fixed size and no routing, so they can easier manage the bandwidth than Ethernet. ConceptDraw DIAGRAM is a powerful network diagramming and vector drawing software that provides the Computer and Networks solution with wide set of ready-to-use predesigned vector stencils and examples to help you design the ATM Networks quick and easy. 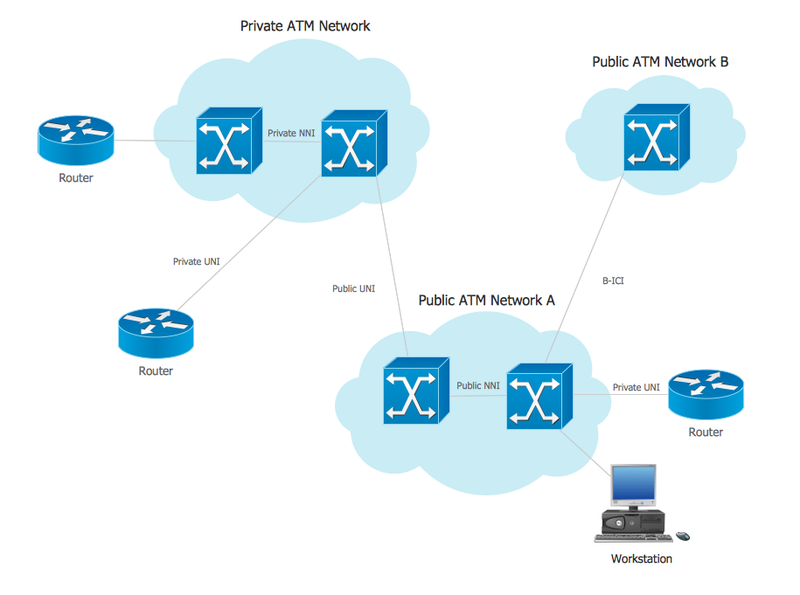 This example was created in ConceptDraw DIAGRAM using the Computer and Networks solution from the Computer and Networks area of ConceptDraw Solution Park and shows the ATM Network. The network diagrams designed with ConceptDraw DIAGRAM are vector graphic documents and are available for reviewing, modifying, and converting to a variety of formats (image, HTML, PDF file, MS PowerPoint Presentation, Adobe Flash or MS Visio).